I'm sitting here waiting for lunch to cook, and just a few minutes ago my belly was very empty. 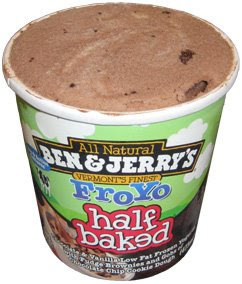 I decided to give it a small sample of Ben & Jerry's Half Baked Froyo. I actually tried it a few months ago but somehow manage to forget to talk about it. Like all the other B&J's froyos, this is respectable stuff. You'll know you're not eating ice cream, but at the same time, you aren't saddled with any unpleasant: no bitter or tartness. no strange aftertaste. no overall funk. It's just a quality product. The difference is the texture. It actually reminds me of that Smooth & Dreamy CVS I had a month ago. A commenter said it best when they described it as "frozen milk", not that ice cream isn't frozen milk effectively, but you still get the idea. It's just not creamy, but as frozen yogurt, you cant expect it to be. If you've been limiting yourself to lower fat foods for long enough, you don't know it's not full fat. This is delish! Their new low fat Phish Food ice cream is awesome too.